Chocolate Cherry Cake is a delicious rich cake that comes together quickly utilizing a devils food boxed cake mix and cherry pie filling. This beauty is perfect for potlucks, holiday parties and busy families. I will start by saying that this is not a made from scratch cake. Although it really tastes as good or better than one. Sometimes life just calls for shortcuts and that is where this cake comes in. I mean I am sure there are days when you could use a couple of clones of yourself. I know I could and today is no exception to that idea. 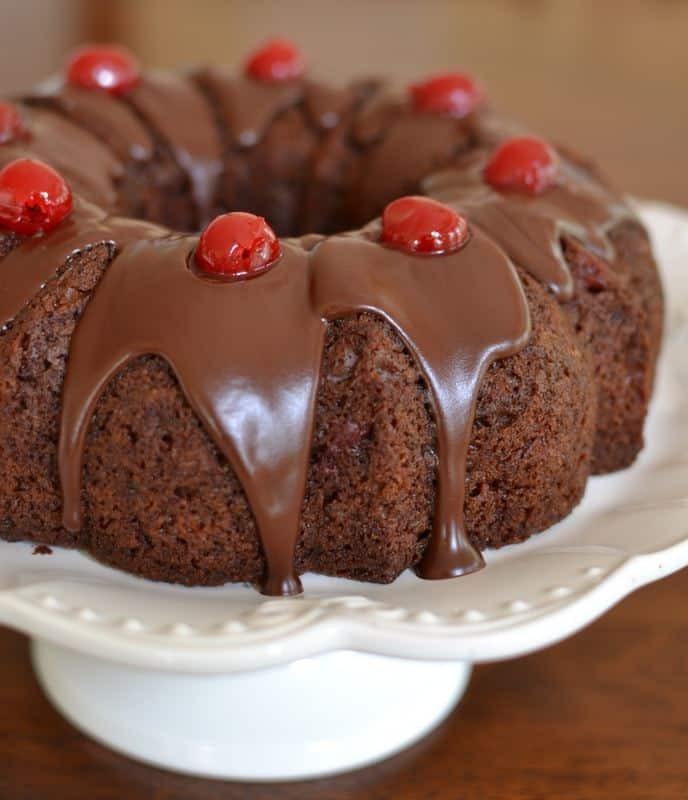 This Chocolate Cherry Cake utilizes a boxed devil’s food cake mix. So if Junior is asking you how much longer the earth can sustain the heat of the sun. Princess is shoving paperwork from school up your nose. Hubby is asking you if you had time to pick up his toothpaste than maybe this beautiful delectable cake is just what you need for that neighborhood gala you are supposed to attend this weekend. First stir together your cake mix, eggs, oil and almond extract. Once you have that all mixed together fold in your cherries. Then pour the mixture into a greased bundt pan and bake. Remove from the oven and let cool for a few minutes before inverting on to serving plate. For the chocolate glaze heat butter and corn syrup in the microwave. Add chocolate chips and slowly heat stirring well between each interval. Finally drizzle over cooled cake and garnish with maraschino cherries. Melting chocolate can be easy if you are patient and follow some simple guidelines. If heated too fast chocolate will seize. Once that happens it is difficult to bring it back to a good consistency. My preferred method is the microwave. Place the chocolate in a microwave bowl. Microwave at fifty percent power for one minute. Remove from microwave and stir gently to melt the chocolate using the residual heat. If necessary microwave for fifteen second intervals stirring each time until the bowl no longer feels warm. Use a double boiler or a bowl that fits over the pan. Fill the pan with a couple of inches of water. Make sure the bowl does not reach into the water. Bring the water to simmer. Turn off the heat and add half of the chocolate to the bowl stirring gently to melt. Add the rest of chocolate in two to three increments stirring gently until the chocolate is fully melted. The slow cooker set on low works really well for melting chocolate. Stir occasionally and make sure it does not overheat. Cook just until melted and then turn to off. Your chocolate is ready for use. 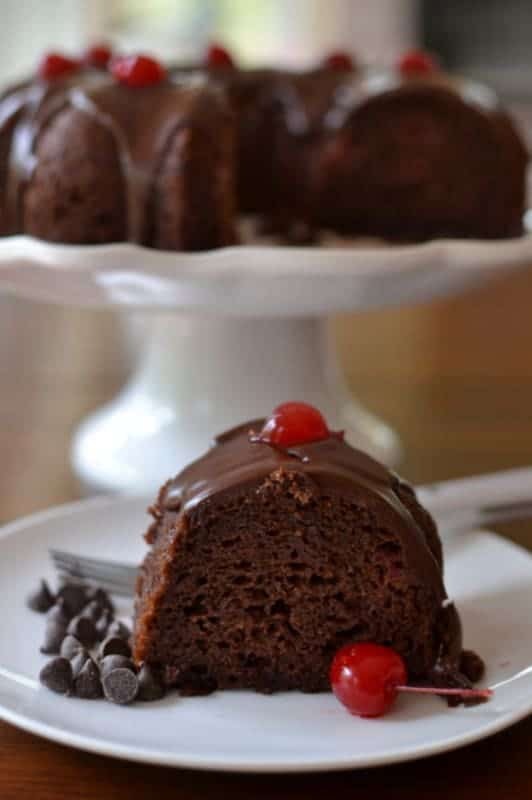 This Quick and Easy Chocolate Cherry Cake combine devil’s food cake mix and premium brand cherry pie filling for an outrageously divine dessert. 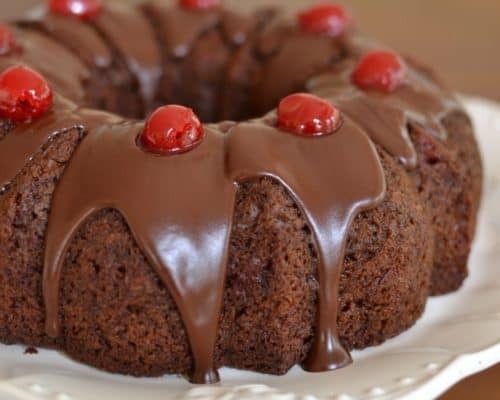 It is then drizzled with a rich chocolate glaze and garnished with maraschino cherries so it looks just as impressive as a bakery cake at a fraction of the price. So if cherries are your thing and time is not on your side put this lip smacking Quick and Easy Chocolate Cherry Cake on your list. No one at your soiree needs to know that it started with a box mix. Other Cherry Recipes you will love! This post was originally published Oct 7th, 2017 and was republished Oct 13, 2018 with new content. 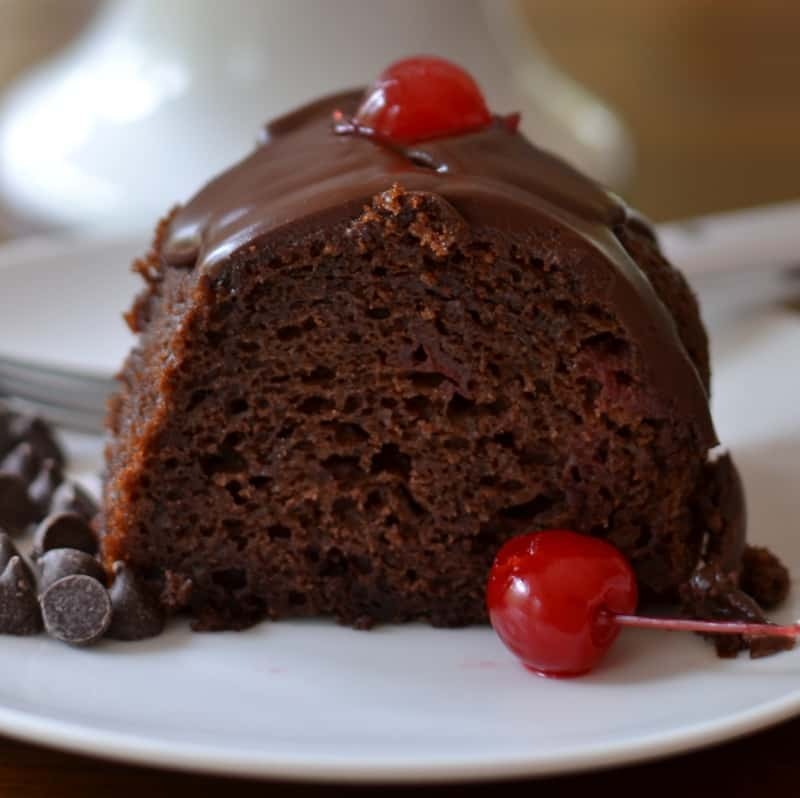 This Quick and Easy Chocolate Cherry Cake combine devil’s food cake mix and premium brand cherry pie filling for an outrageously divine dessert. Preheat oven to 350 degrees. Spray bundt pan with nonstick baking spray. In large bowl stir together cake mix, eggs, oil and almond extract just until incorporated. Fold in cherries. Bake for 40-45 minutes. Cool for 15 minutes and invert on to cake plate. Cool cake completely; approximately 2 hours. In microwavable bowl or Pyrex measuring cup microwave butter and corn syrup for 45 seconds at 50% power. Add chocolate chips and microwave for 45 seconds at 50% power. Remove from microwave and continue stirring until chips are melted. If necessary you can microwave for 15 second interval at 50% power until the chips are melted. Stir in vanilla and drizzle over cake. If desired cut maraschino cherries in half and arrange on top of cake or at base of cake. Besides being gorgeous, this was SO delicious and easy to make! I want this ganache on everything! Such a great cake. Love chocolate and cherries together!